Labouré's program is 100% online and will prepare you to start a new career in one year. Some of the fastest growing careers in healthcare involve working with computers, not patients. Medical coders convert physician's notes and medical records into code for billing and insurance purposes. Certified professionals are in high demand and are able to work in hospitals, doctors' offices, and insurance companies. Students who complete the Medical Coding Certificate are eligible for a variety of coding credentialing exams with AHIMA and AAPC. Coding courses start each Fall semester, and students can complete the program in 1 year. After working as a nurse for so many years, I didn’t want to abandon the healthcare industry. I wanted to use my knowledge of disease and patient care in a new and different way. I saw an article about medical coding in a magazine and decided to look into it. I visited the American Health Information Management Association (AHIMA) and American Academy of Professional Coders (AAPC) websites looking for information and saw Labouré College listed as an approved school. Finding a school that was accredited and recognized by relevant governing bodies was really important to me. I also knew co-workers who had attended Labouré for nursing and spoke highly of their time there." 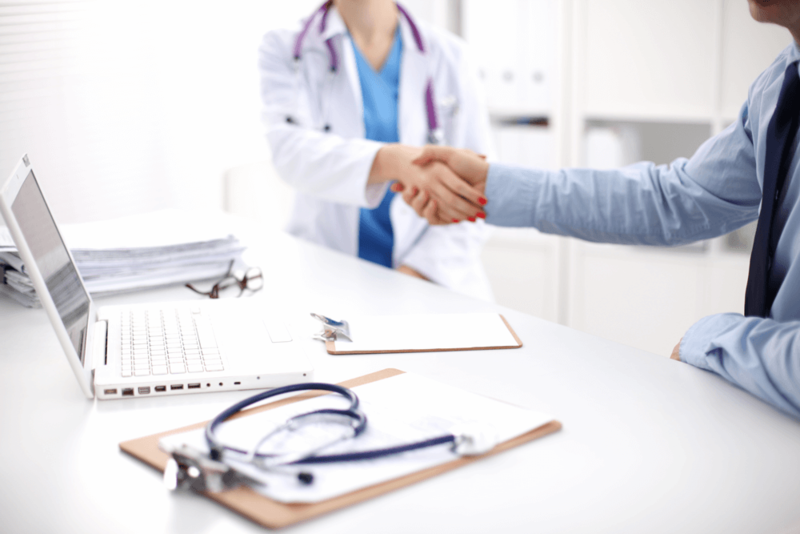 “As a certified Medical Coder, your options are wide open. Medical Coding allowed me to support myself and my children as a single mother. The world is yours. There are so many things you can do with this education - you are the only one who will limit yourself." 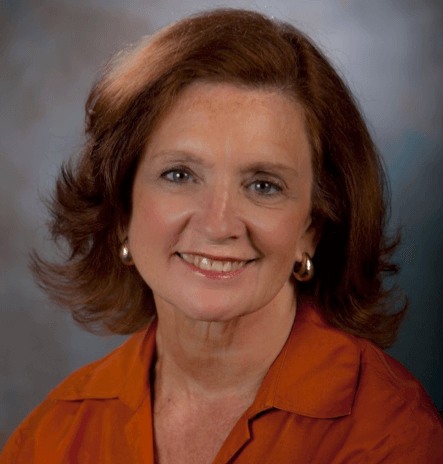 Elise Belanger, RHIA is a graduate of Northeastern University's Health Information Administration program and has 40 years of experience in health information technology. She received the Professional Achievement Award from Massachusetts Health Information Association in 2016, and has over 20 years of teaching experience. Elise is available to answer questions you may have about this program. Contact admissions@laboure.edu if you would like to speak to Elise. The average yearly salary can range between $44,338 and $89,546, or more depending on education level and part-time or full-time employment. Are medical coders in demand? Will I be able to find a job? Why? By 2030, the number of Americans over 65 will double. That means a huge increase in the workload for healthcare providers, which in turn means more work for medical coders and HIT professionals, like you! The skills you will learn are in high demand. Today’s healthcare industry relies on digital systems to record key data for medical services, diagnoses, and medical claims. As these transactions get more sophisticated, providers and payers will need certified employees able to accurately input, track, and analyze electronic health data. 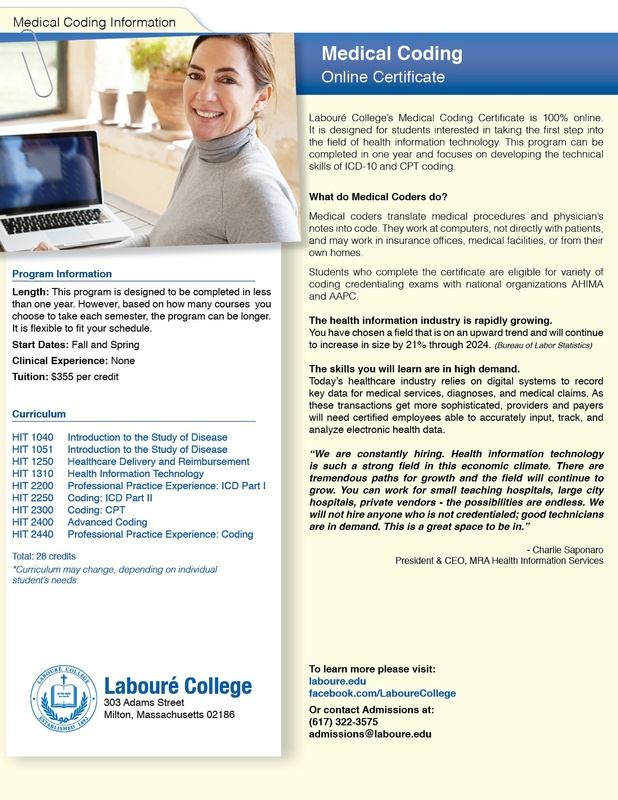 The medical coding program starts each Fall semester, and is designed to be completed in just under one year. However, based on how many courses you choose to take each semester, the program can be longer. It is flexible to fit your schedule.